One of the negatives of recording the majority of the TV shows we watch is that by skipping commercials we sometimes miss out on some really cool stuff. Recently I saw a commercial for something that apparently has been out for a while, but was so awesome it will allow me to wrap up my Christmas shopping before November rolls around. For those of you on my list I apologize for telling you what you’re getting. All you have to do is act surprised because I know you’ll be excited about your present. A few years ago the big craze was the Snuggie. Tammy loved them so much she’s got 3-4 of them, but I think they’ll become useless once she opens her Christmas present this year. In steps the Forever Lazy (also sold under the name Uni-Lazy) which closed the gap, literally, left by the Snuggie. Forever Lazy® is the one-piece lie around, lounge around, full body lazy wear that covers you from head to toe! The blown out backside, what a relief. I can’t tell you how many times I’ve wished my jeans had the ease and convenience of a build-in trapdoor. Fortunately I’ve been able to avoid accidents by simply heading to the bathroom a little earlier. Considering it’s being marketed to lazy people, the trapdoor is prolly a good idea. Should we be moving these boxes? Nope, let's play pool. 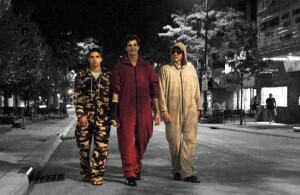 But the Forever Lazy isn’t just for lounging around on the couch. Nope. It also is showing up wherever people are gathering to have a good time. Whether it’s hustling your friends at pool, taking a walk with the crew around the neighborhood, tailgating before the big game or watching your favorite team with the guys, the Forever Lazy will help you look stylish AND keep you warm. Better not mess with them. You know what to wear if you’re coming over. 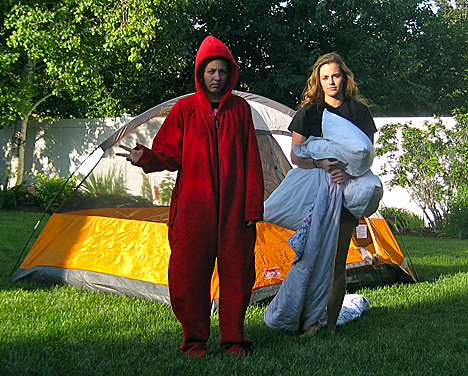 Be the hit of the parking lot in your Forever Lazy. But these things aren’t just for lazy and/or party people; it’s good for couples as well. Going camping with your BFF? 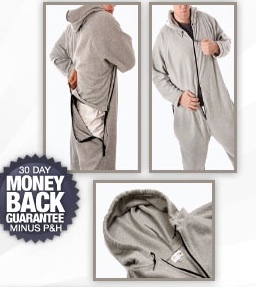 The Forever Lazy has you covered. Who looks happy and who wishes they had the Forever Lazy? Having some ice water on the patio with your significant other? Perfect time for Forever Lazy. Her: Guess if I’ve got anything on underneath? Him: Man, I wish this was Vodka. No better time to be Forever Lazy than a quiet Christmas morning by the fire. You shouldn’t have. Nothing can top the best gift ever. Maybe you just want to end the day watching the sun set over the water. 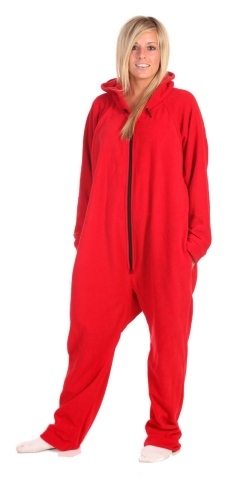 No reason the Forever Lazy can’t join you. Her: I’m pushing him in because he’ll sink like a stone with that thing on. 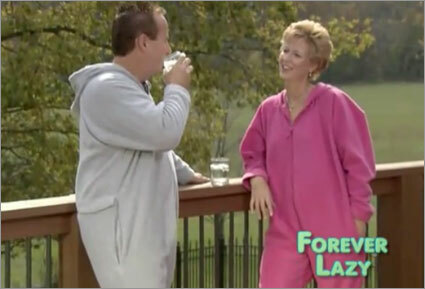 You’re prolly thinking “How have I not seen this already?” but still may not sure if the Forever Lazy is right for you or your loved ones. I’ll let some of the satisfied owners take it from here. I did a quick search on Google and found that Paul D. Burg is the President and Director of Highland Liquor and Wines, Inc. in Sarasota, Florida. So it’s possible his 24-hour nap had nothing to do with the Forever Lazy and everything to do with him drinking so much he passed out. I can’t take this damned thing off!! It’s too comfortable and fun to wear!! That is why I just order [sic] three more colors last night so I can jump outta one pair and right into another without suffering any or very limited withdrawals (don’t want no Uni-Lazy DTs!!!). I couldn’t tell if Arlen is pissed about not being able to take the Forever Lazy off or not. But if he/she knows about “DTs” then Arlen’s got more pressing issues than being addicted to exclamation points. My husband and I are relaxing for the evening in our UniLazies that just arrived today. I was a big fan of the Snuggly, but the UniLazy puts it to shame! I want to live in my UniLazy and Crocs from now on. Thank you! Don’t know what bothered me more, the fact that she made the husband immediately wear the Forever Lazy or that she’s besmirching Crocs, which I love. Can I tell you both that I love my Uni-Lazy sooo much!? Last week I was sick all week. That was my blankie. Got me through a week-long flu… This week we started out with freezing cold pouring wet weather. Every morn and night, lazy on over my nightie. Cleaning dog poop, doing outside morning chores. This is the greatest invention! If you ever meet someone named Kristina and she owns a Forever Lazy, run. Run and never look back. Not only is she disgusting (wearing her Forever Lazy the entire week she had the flu AND picking up dog poop in it) but she doesn’t know when to use commas. Wow, you’re pretty awesome! But subtle…more like an awesome ninja. I’m sure that the you’re very busy at this time of year with both the cooler weather… but I appreciate the attention and really good customer service that I’ve received from you thus far. This is the one that sold me. Partially because I thought Mike was talking to me at the start of his statement, but anything that makes me feel like a ninja (isn’t “awesome ninja” redundant?) is something I need in my wardrobe. Gallery | This entry was posted in Daily Life and tagged Christmas, daily life, forever lazy, humor. Bookmark the permalink. I hope I’m on your list! I want one of those. Gosh, blanket sleepers for adults. With a back door. Genius. Who knew it would be so simple to finish Christmas shopping this year?! Imagine how happy you’d be to open up one of those Christmas morning!! The only thing I’m upset about is that they only come in three colors. Where’s the leopard print, camouflage, prison suit orange?? Makes sense that you haven’t heard about the Forever Lazy yet since you’re all “Down Under,” what with the toilets running all backwards and everything (learned that from The Simpsons) but I can’t believe the Snuggie is just now getting there!! Tammy’s already torn through at least two and you haven’t even gotten one yet!! My sister has threatened to disown me if I get her a Forever Lazy. Sounds like I might need to get her two, one for home and work. Actually I spent all of last night calculating, that if 10% of the 25 million people in Australia think its half as popular as you do, and buy them for all their friends and relatives for Christmas, I might want to get in on this proverbial gold mine, and import them myself!